The Whites are on the road again following a brilliant win over Aston Villa, to play in a game that has been won by the away side five times in a row in the Championship. George Singer takes a look at the stats in the latest Fulhamish preview. Hello and welcome to another edition of Before the Whistle! 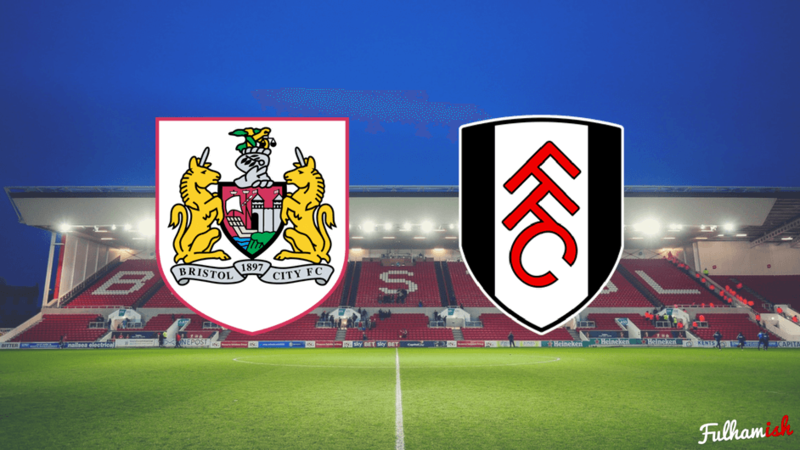 Today I take a look at our next opponents Bristol City, and look what we need to do in our continued hunt for automatic promotion places. In a Haloween howler at the Cottage, the Robins staged the ultimate smash and grab – winning 2-0 and reducing us down to 10 men in the process. Surprisingly, Jokanovic used the match as an opportunity to try out a 3-5-2, a setup not seen at the Cottage since the end of the 15/16 season. The tactic backfired spectacularly, with a disorganised Fulham defence unable to deal with the fast Bristol counter. Two unanswered first half goals from Bobby Reid and Korey Smith were enough to seal the victory for the Robins, continuing their march into the playoff positions. The second half produced one of the more bizarre moments of the season: Abou Kamara was sent off for an apparent push on Bailey Wright, extinguishing any embers of a Fulham revival. However, the decision which was subsequently overturned and City player was given a suspension for diving – much to the anger of the Bristol fans. As we attempt to make amends in the reverse fixture, what lineup are we likely to see from Bristol City? In their most recent match against Leeds, where the Robins again threw away a comfortable winning position, City lined up in their tried-and-tested 4-4-2 formation. Whilst they’re likely to line up this way again on Wednesday, as they have all season, there will surely be a couple of changes in personnel. Midfielder Marlon Pack is suspended, but regular CB Nathan Baker returns from a 3 match ban. This style of play has brought a remarkable change in fortunes for the reds, going from relegation favourites last year to league cup semi finalists this year. However, the tide now seems to be turning – and the Robins are now on a run of just 1 win in 11 (in all competitions). Opposition teams are finding exploits in their system, and their physical style of play is tiring their small squad out. Whilst their system may have some flaws, they are clearly a dangerous attacking team that we will need to prepare for. So who in particular do we need to look out for? My man to watch this week is Bobby Reid. The striker is the top scorer in the club, and is thriving in a fast and direct style of play. In particular, he has a habit of getting on the end of crosses from quick breaks forward – which is how he scored against us at the Cottage. Bobby Reid’s shots this season: signs the player is having plenty of shooting opportunities in his team’s system. So what notes would I give to Slav this week? Firstly, in attack, we should make the most of the counter attack. Whilst our natural game tends to revolve around slow buildup, and applying pressure on their defence, this may be a game where moving the ball forward on the break can give City a taste of their own medicine. Secondly, we need to watch out for the fast Bristol counter. City will look to move the ball forward really quickly, and we need to be clear on responsibilities in our defensive transition. In the reverse, where we tried out a new formation, our defensive organisation was poor and we were punished harshly. If we can work on these 2 things in training, I see no reason why we can’t continue our great form and see off a crumbling City. If we can do this, and get the 3 points, we’ll surely be pretty close to wrapping up a top-6 place.